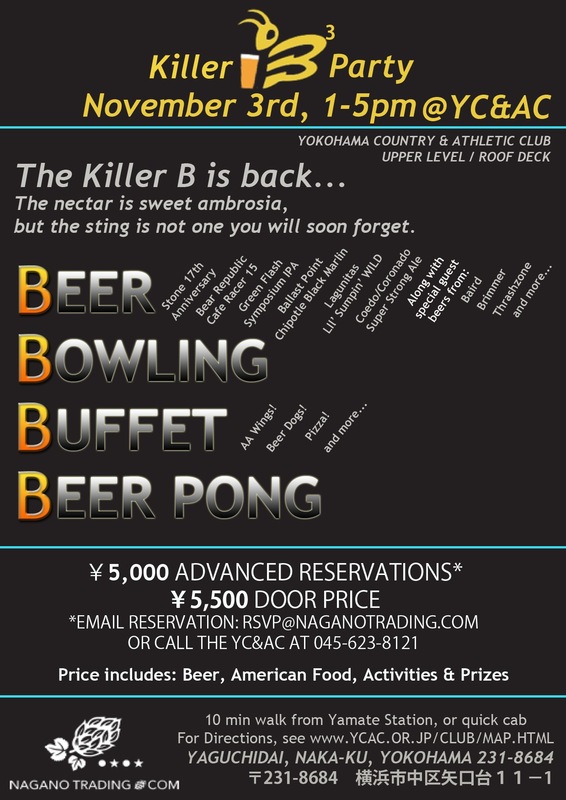 That’s right folks, it’s time for this year’s Killer B! We’ll be rocking the taps from 1-5pm on Sunday, November 3 at the YCAC (same location as last year). The YCAC is a 10 minute walk from the JR Yamate station, just a few stops from Yokohama on the JR Negishi line. We know it’s a Sunday, but never fear, you have a Monday holiday to recover! Nagano Trading is pulling out the big guns for this year’s beer lineup. Beer isn’t all we’ll be bringing you, however, we have all the B’s lined up. We’ve prepared a new and improved food Buffet, and you’ll also get to have fun with Bowling and Beer pong. Enjoy the Yokohama Breeze while you partake in copious amounts of food and drink on YCAC’s upstairs terrace, usually available only to club members. We’re already seeing a large amount of RSVP’s coming in, so make sure to reserve your spot early. Make sure to let us know the contact person, contact number, email address, and number of people for your RSVP. If you send us an email, we’ll reply back with instructions for payment via domestic bank transfer (furikomi). Please be aware that we do not accept cancellations once payment has been made.